Same electronic performance as the award-winning TableMikes in an industry first small USB module. Dual functionality (“MultiAdapter”): very Long-range and variable dictation distance of up to 50 cm or 20″ with maximum accuracy, under Green LED meant for the industry first TravelMike, and Normal mode for headsets under Blue LED. 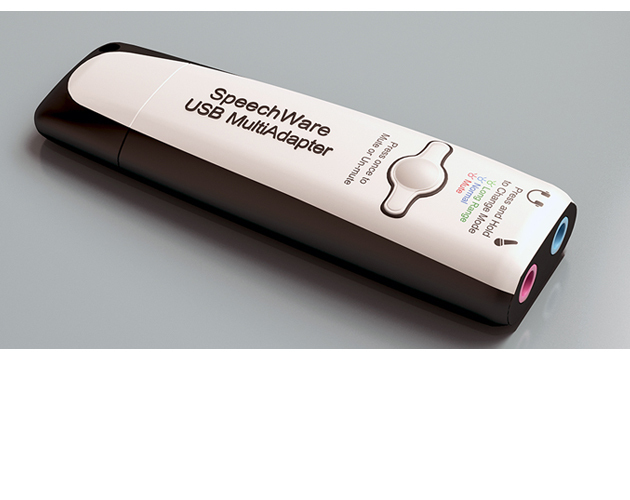 The SpeechWare USB MultiAdapter connects with the optional 90º elbow fixed or 180° pivoting USB connectors as well as a small mini boom, to become the unique TravelMike ideal for notebooks and tablets. It is also the best companion for our FlexyMikes and most alternative headsets. Innovative multipurpose USB Audio adapter with standard 3.5 mm Mic input and output Sound jacks in an ideal format for any Notebook, Ultrabook or Tablet PC. Industry first integrated Digital Sound Processor (DSP), Speech Equaliser (EQ) and Automatic Gain Control (AGC) for long-range and variable dictation distance, identical to the award-winning TableMikes. Single translucent Push Button supporting the long-range (Green LED), normal (Blue LED) and mute (Red LED) modes (“MultiAdapter”). Optional, fixed or pivoting USB connectors, as well as detachable and interchangeable mini boom (18 cm or 7″) with flexible tip for perfect positioning (TravelMike). Wideband and 20 kHz High Definition VoIP. Supports the SpeechWare FlexyMikes and most alternative headsets. Two-year warranty. 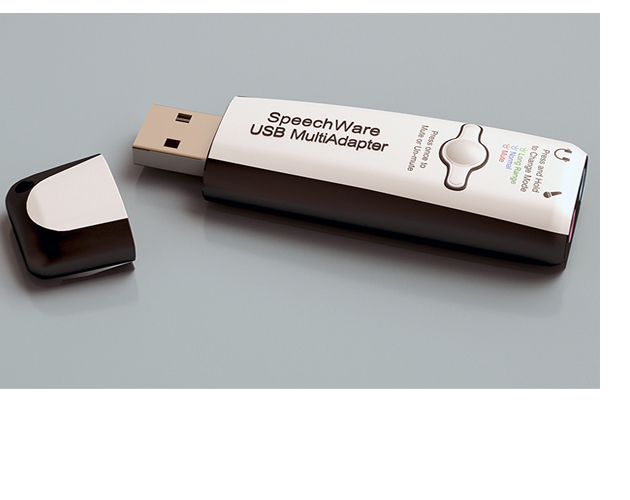 *Compatible with Dragon NaturallySpeaking®, Microsoft Speech for Windows®, Google Voice®, Skype®, VoipBuster®, etc.